We have pretty much learnt all Chinese numbers together with some related Chinese characters during past a few lessons. Now it is time to move to some other groups like directions. Before that we need to prepare ourselves with one new Chinese character "木". What is the meaning of "木" then? As you can see from Oracle Script of "木", it is a drawing of "a tree" with as its trunk and branches and as its roots. "木" is later extended to mean "Wood" as well. Bronze Script , Seal Script continues its Oracle Script, while Clerical Script faded away the branches with a "一" to get what are using today: "木". 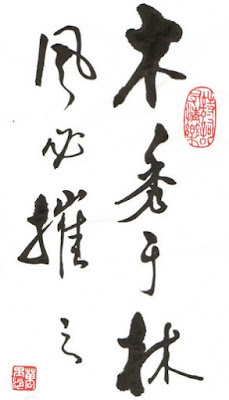 There are many interesting characters created with "木", like "本"， “末”， “林”， “森”， “休”. I will leave them for you to guess their meaning before we get back to them in the future. Now it is time to enjoy a Chinese Calligraphy with "木" inside. In our next lesson, we will learn "东" in Simplified Chinese or "東" Traditional Chinese. Its Oracle Script is . What will be its meaning while talking about directions? Along the way you are learning Chinese characters with us, you would probably join me to dislike Simplified Chinese characters as they have lost the essence of our Chinese characters.